Now I know what you’re thinking, Thanks Giving? Isn’t that an American tradition? It sure is, and even though we have lots of lovely readers from America (hey you guys!) we still wanted to celebrate this tradition for ourselves. In fact, I’m pretty disappointed that more people in the UK don’t celebrate it! It’s such a beautiful and lovely idea to dedicate an entire day to things you are thankful for! Me & Em decided we would kick off the traditions by cooking a Thanksgiving dinner for everyone, we had the Turkey, the cranberry sauce and the mash potato on our minds all day but first we had to style the table! 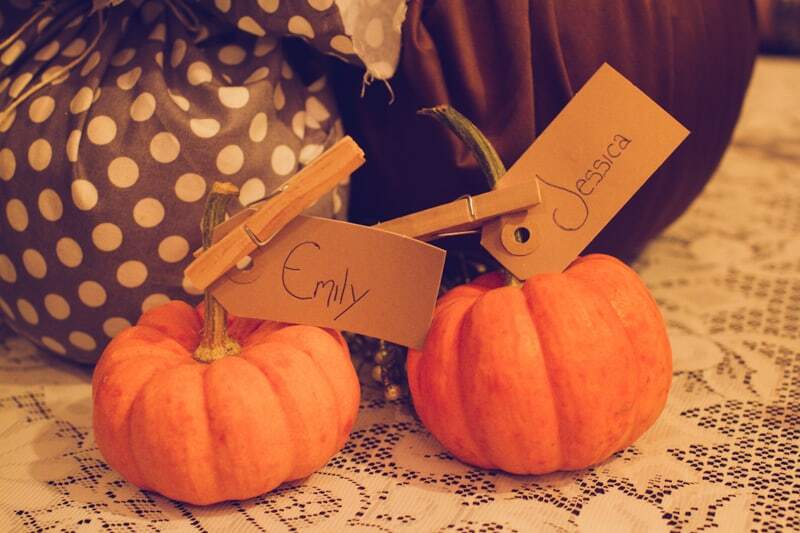 We decided to go with a brown, white and grey theme with a splash of mini orange pumpkins thrown in! Since we didn’t want to go all extravagant with the decorating either we thought we would use what we had around us, and living in the Forest Of Dean pretty much meant we were using leaves for a main part of the decor! We dried them out then scattered them all over the table, in people’s place settings and even hung them on the edges of the fairy lights to make it look like they were falling! Awh…I know, we’re cute. Ha! The dinner was a hit with everyone and we had TONS of food left over! Does this happen to you too? Either way me & Emily were just relieved that we managed to cook a whole Thanksgiving dinner for 8 people on our first try! ♥ Being able to work with one of my best friends every day and being able to work at something that I truly love and enjoy! It was always my dream to wake up in the morning and feel excited to start work! ♥ Being able to travel around Canada this year and have family and friends over there who were willing to put me and James up and show us their beautiful country! ♥ A supportive family who believes in me and are all fit and healthy! ♥ James, who is constantly supportive of me, thoughtful and kind! ♥ Such awesome friends in the industry who constantly lift me and Emily up and inspire us! We love you guys! This year, Emily is thankful for..
♥ Last year was a pretty tough year for me as my family was hit with the tragic loss of my grandad, my family kept me completely sane in what I would call the hardest year of my life and this year their support has continued to be phenomenal. I love them all with every inch of my heart and although a tad crazy at times I would not change them for the world. ♥ I know Jess has already said it but getting to work with one of my best friends everyday has to be the most wonderful feeling. For us everyday is an adventure and I wouldn’t change it for the world! To quote myself when I got drunk at the Wedding Blog Awards this year “Jessica, you are like the sister I never had!”. ♥ The ability to live life to the full! Everyday I am thankful that I am happy and healthy and able to do whatever I want to do. ♥ The support from the wonderful man in my life – I love you Mr T! ♥ My cats, they are my comfort blankets and a snuggle from them just makes my day everyday! ♥ Wonderful friends! It would be impossible for me to name every single one of you because we would be here all week but honestly I have the most amazing friends. What are you thankful for? Leave a comment and let us know! Happy Thanksgiving for yesterday everyone!